Unusual specificity on the amount of blood. I thought it was extremely interesting that God would get so specific on the amount of blood in Revelation. It was so unusual, it intrigued me. It states that the blood would reach to the horses bridles and cover a space of sixteen hundred furlongs. Why would the Bible be so specific? Perhaps there is more here than meets the eye. So I set off to do some basic math to get some better insight. What I found was no less than spectacular ! My discovery went from curiosity, to dismay, to sheer elation. 41679069367243.92 Gal (x4) = 166,716,277,468,975.68 Qts. As taught so often by prophecy teachers, the blood level only shows a lot would die in the battle of Armageddon. I presumed that this pond volume might actually tell us how many are fighting. I was dismayed to learn how 'off' the number was, 33 Trillion vs 6.5 Billion. I then suspected Rev 14 was only a symbolic illustration for 'a large amount'. It became irreconcilable for that number of humans to be fighting much less living. I postulated, unless it was from the beginning of mankind. The old testament supports this and says that the earth yields up all the blood of her dead. [ OH MY GLORIOUS GOD...! ] biblical scholars estimate†, all humans that ever have lived before and after the flood, based on normal population doubling logarithms to be 35.1 Trillion!!! Breathtaking genius from our LORD Father. Beloved, from the time of Abel, his blood has been screaming out from the ground; the earth has graciously opened her mouth to receive Abel's blood. Unto this day the whole earth travails with the fullness of time; blood, fire and pillars of smoke. In that day; fountains of blood shall shoot forth from the great deep, to smite the waters again, the windows of heavens will open and rain blood upon the earth. His righteous winepress shall overflow fat upon the ground yet again. An offering unto the Father of Lights, a foot wash for His bride and a drink for dogs. Rev 14:20 is not illustrative symbolism, but literal and a testament to the Bible's own scientific accuracy and divine authorship. It tells us that this is not just sinners blood, but of his saints as well, past and present. It disproves Evolution population estimates‡ of 18,932,139,737,991 with 360 figures following. 1st century John, a prisoner on the island Patmos, could never have estimated how many furlongs or depth the blood should have been. Even if he had a computer, and a knowledge of medicine and the number of all who died before him. This is simply due to the fact, that the population since John to present day, had not been born yet. He would have had no numbers to work with. Divine numbers were imparted to him is the only conclusion. It also functions as an approximate clock for the return of Jesus. If 35 trillion is the estimate of humanity and 33 Trillion is what it would take to fill the lake, then we are very close or spot on (pending deviations), in the big timeline. It unifies the scriptures; Thrust in the sickle for the earth is ripe. All of humanity is in the winepress of judgment day. Also that, flesh and blood cannot enter the kingdom of God. Also that all the dead 'not in Christ' are resurected after the 1000 year reign for the last battle of Gog and Magog. It also shows that the "Battle of God" is not a battle between the 'good guys' of NATO and Russia and China. But rather between God's servants (144,000 = Kings of the east), and the living tares. Gog and Magog are literally Noah's grandchildren. They also are all the evil in the world from Adam till His return, not Russia. The same is true of Babylon, it does not mean Iraq in the book of Revelation (how silly). Embarrassingly as it is for the lie weavers; Gog and Magog's battle is not during the formal Tribulation Period, but 1000 years later when satan is released. This is duly sustained by the fact, there are not enough humans alive now (6.5 Billion) needed to fill that volume with blood. It also shows they are not fighting each other but all of resurrected unsaved humanity is attacking His saints. A crystal clear Post-Tribulation Model. 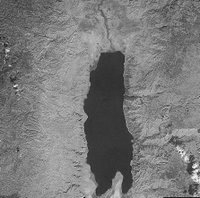 The Dead Sea amazingly is the right volume for all of humanities blood; in fact it is also below sea level, meaning it's banks could easily overflow with extra room to spare. Beloved Children of Abba, this is the fulfillment of Zechariah 14:4. "And in that day His feet will stand on the Mount of Olives, Which faces Jerusalem on the east, just outside the city. And the Mount of Olives shall be split in two, from east to west, making a very large valley; Half of the mountain shall move toward the north And half of it toward the south." This will create a great valley running due east and west, to be called the 'Valley of Josaphat'. As the Bible proclaims, this will cause the largest earthquake that history has recorded, to create the largest winepress. Glory and honor to the Holy Spirit; 15 miles (24 km) due east is the salty Dead Sea basin! The valley will be filled to the height with the bodies; "I will also water with thy blood the land wherein thou swimmest, even to the mountains; and the rivers shall be full of thee." As you read, it is drying up for the cup that will yet overflow. "For every one shall be salted with fire, and every sacrifice shall be salted with salt." This is where all the blood of humanity since Abel, to those living at that time will be reaped in the great winepress of God. It will flow directly into the Dead Sea and fulfilling Joel's question; "Will he leave a meat and drink offering?" Yes, as all High Priests do unto the LORD God; Jesus will use the great valley to tread and squeeze out every last drop, immediately after the harvest. Then the bodies will be traditionally burned in the newly dried Euphrates, prepared as a lovely dinner for the birds. Sin has flowed into the Dead Sea from the time of John the baptist, it will again flow holding all sin for mankind. Seek and call the LORD while He may be found. Blood Lake is 37.85 cubic miles in volume. The Dead Sea is 30.7 cubic miles in volume. It is also below sea level, easily allowing for extra volume. The Dead Sea has been drying up for decades from canals and dams. The cup prepared for such a time to come. Now, if there had been no flood to destroy the human race, then the descendants of Adam, in the 7333 years would have been 16,384 times the 1,804,187,000, or 29,559,799,808,000; or computed at the Jewish rate of net increase for 7333 years since Adam, the population would have been still greater, or 35,184,372,088,832. These calculations are imperfect accord with the Scripture story of the special creation of man, and the destruction of the race by a flood. Had it not been for the flood, the earth could not have sustained the descendants of Adam. Is not this a demonstration, decisive and final? The evolutionists claim that the human race is 2,000,000 years old. There is no good reason for believing that, during all these years the developing dominant species would not increase as rapidly as the Jews, or the human race in historic times, especially since the restraints of civilization and marriage did not exist. But let us generously suppose that these remote ancestors, beginning with one pair, doubled their numbers in 1612.51 years one-tenth as rapidly as the Jews, or 1240 times in 2,000,000 years. If we raise 2 to the 1240th power, the result is 18,932,139,737,991 with 360 figures following. The population of the world, therefore, would have been 18,932,139,737,991 decillion, decillion, decillion. decillion, decillion, decillion, decillion, decillion, decillion, decillion; or 18,932,139,737,991 vigintillion, vigintillion, vigintillion, vigintillion, vigintillion, vigintillion.